Dampney Company, Inc. has been successfully supplying corrosion resistant high temperature coatings to the refining, offshore, petro chemical, chemical, power and related Industries for more than 72 years. Some of our coatings are used to solve the problems associated with Corrosion Under Insulation (CUI), but before addressing our solutions to CUI, we present a simplified model of what happens to steel when it rusts, and then the role of the insulation systems and the reactions within these systems that influence CUI. The essential requirements for steel to corrode are the availability of oxygen and an electrolyte (water, condensation, rain, dew, etc.). The rate at which corrosion will occur is a function of variables such as the surface temperature, amount of oxygen available and the type of contaminants on the surface (i.e. salts, chemicals, etc.). Reference No. 1 (NACE RP-0198, Figure No. 1) presents data associated with the influence of water temperature on the corrosion rate of steel in a closed and an open system. Industry considers that carbon steel operating in the temperature range between ambient to about 300°F (148°C) is where CUI is most likely to occur. Steel above 300°F is too hot for water to remain in contact; therefore, when the electrolyte element of the corrosion model is gone, corrosion will not occur. Note that this is only applicable to systems that operate continuously. Systems in cyclic service will always be subject to CUI. Now it is time to understand the dynamics of what really happens within the insulation and jacketing system (exterior cover). The insulation thickness is generally designed to conserve energy or to maintain an outer jacketing surface temperature of 140°F to 160°F (60°C to 71°C) (which is to minimize severe burns if someone touches the insulated surface). This outer temperature is generally determined by each facility to meet its “Personnel Protection Temperature Limit Requirements”. The jacket is usually made from aluminum or stainless steel and should have some type of paper or plastic corrosion barrier bonded to the inner side to prevent the jacketing from direct contact with the damp or wet insulation. The jacketing system should be designed to be water tight; however, that rarely happens due to a myriad of situations including improper design, wrong insulation material for the service conditions, improper installation, improper sealing at joints and protuberances, etc. Because of these reasons, many insulation systems are designed to be “self bailing”, which means that water and moisture that leaks in is permitted to leak out. What doesn’t leak out is generally absorbed within the insulation system and resides there as water, moisture, steam or a combination of those items. As the insulated steel surface temperature rises above the boiling point, any water in contact with the steel or hot insulation will turn to steam and eventually move away from the steel and back into the insulation system (and recondense when it can cool down below 212°F (100°C)). This point will move back and forth as the steel cools down and heats up (possibly from cyclic equipment operations, weather changes and/or as more water leaks into the area). There can be a series of these dynamic areas that exist throughout the system and we will define them as the “Boiling Point Isotherms”. As the steel temperature cycles rise or fall, the Isotherms will move back and forth within the system. When the moisture is boiled away, the steel temperature rises, the insulation dries out and the corrosion stops. If no electrolyte is present in an insulated area, corrosion will not occur, but when an electrolyte migrates back into that area, corrosion activity will restart. Figures 2 and 3 are presented to exemplify the dynamics that are constantly occurring within insulation systems. 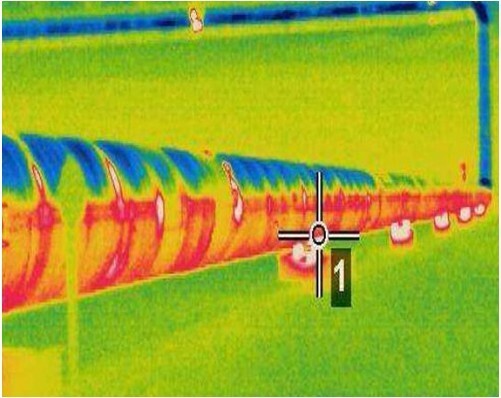 These Figures are Infrared Thermal-Grams of insulated horizontal pipe sections that have significant temperature differences within the insulation systems. The amount of steam, water, moisture, etc. in the insulation causes increases in the thermal conductivity of the insulation and results in higher jacket temperatures. The lower photo in Figure 2 is the actual pipe section. 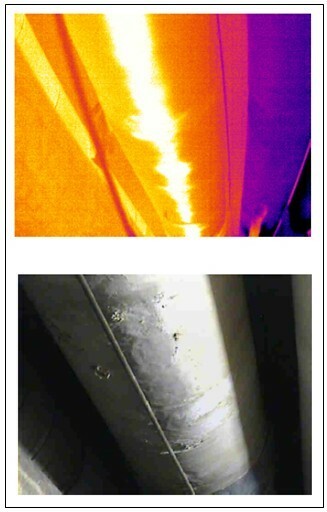 The upper photo is a Thermal-Gram of that pipe, the white color in the lower area of thermal-gram in Figure 2 is the hottest area and the yellow and orange areas represent cooler sections of the outer jacketing (moving upward). The white color along the bottom of the pipe is associated with hot water and steam laying in the bottom of the jacketing and eventually collected sufficient volume to come into contact with the bottom area of the hot pipe (gravity has allowed the water and condensate to collect in the bottom of the insulation system). Higher on the exterior jacket, the temperatures decrease because the insulation is drier and becomes more effective. 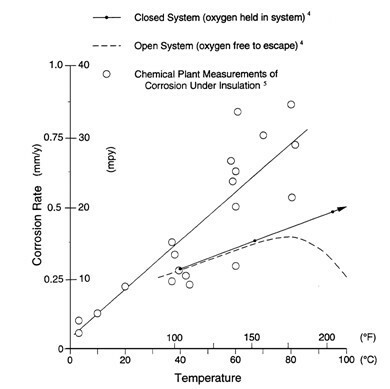 The Thermal-Gram in Figure 3 is from a low temperature steam line. Note that the pipe supports (white colors at the bottom) are “thermal shorts” to the hot pipe, and the wet areas (shown in red) are approaching the high temperature of the pipe supports. Again, the top section of the jacketing system is approaching the temperature of the cooler environment. It is also worth noting that the wet bottom area of piping systems is more likely to corrode than any other area on the pipe. Areas on vessels that allow water to collect, such as insulation support rings, are locations where the corrosion is likely to be found. Any protrusions through the jacketing system, such as nozzles and piping, are also candidates for water entry and can cause corrosion problems. There can be various contaminants on the surface of the jacketing and these contaminants can be picked up and carried into the insulation when the water enters. As time goes on, and depending on the type of fall-out on the surface, the water that leaks into the system can have a variable pH (rainwater, acid rainwater in industrial regions, salt water, fire system deluge water from periodic tests, contaminants from the surface, etc.) Reference No. 2 (NACE Corrosion Engineer’s Reference Book, Third Edition, Page 78) presents a curve of pH values of pure water that ranges from 7.4 to 5.6 as a function of temperature. If that happens to “pure water”, imagine the potential for changes inside the boundaries of the insulation system. Additionally, as described above, when the steel temperatures cycle up and down, the isotherm position within the system changes. When the temperature of the metal drops below 212°F (100°C) and condensation occurs or water leaks in, some of these new contaminants that enter the system can migrate toward the steel and eventually be deposited there. These contaminants can cause the steel corrosion rate to increase. Now that we see the “Dynamic Picture of CUI”, what should we do to fix the problem? As stated, there are three basic requirements (base metal, oxygen and electrolyte), and if we utilize a coating system that keeps the moisture and oxygen away from the steel, we have solved the problem. That is where the Dampney Company’s experience with high temperature coatings technology over the past 72 years becomes important. Through the use of properly designed high temperature, high build barrier coating systems, the steel can be isolated from the electrolyte and thus stop the corrosion process. Thurmalox 70 Series – Specially designed for use on Insulated 300 Series Stainless Steel (this system is chloride and halide free, to guard against chloride induced stress corrosion cracking). Thurmalox 218/219 – Organic/Inorganic Hybrid Coating System is suitable for use on insulated carbon or stainless steel that has service temperatures up to 450°F (232°C). This coating system can be applied at ambient temperature or can be “Hot Applied” to operating equipment and piping when surface temperatures are as high as 350°F. The constructability properties of this system make it ideal for shop applications that require excellent resistance to abrasion and damage due to handling, shipping, storage, and field erection for new construction projects. Thurmalox 225HD – High Build Coating is suitable for use on insulated carbon or stainless steel service temperatures up to 1000°F (538° C), with peaks to 1200°F (649°C). This coating can be applied at ambient temperature or can be “Hot Applied” to operating equipment and piping when surface temperatures are as high as 450°F (232°C). Thurmalox 837 – Inorganic Zinc Co-Polymer Primer provides an excellent high temperature base for extended periods of inactive cyclic service of carbon steel piping and equipment when used in conjunction with a sealer coat of Thurmalox 225HD High Build Coating. PLEASE CONTACT YOUR DAMPNEY CUI SPECIALISTS FOR RECOMMENDATIONS SPECIFIC TO YOUR SERVICE CONDITIONS.